One of the things I love about blogging is meeting people who become the friends I have never met. Debbie is a mom/grandma who blogs about her life and experiences with her preschooler. I love how she incorporates learning into play! 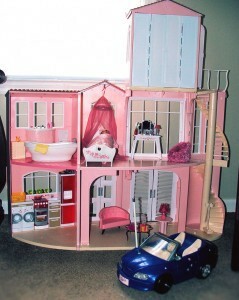 Debbie collected a bunch of doll houses, barns, and cars and trucks to create a mini-doll city. I love how she morphed this dollhouse “game” into a discussion of government and city planning! I only wish we had as many houses as Selena does so we could replicate this activity. Thanks Debbie of Children Grow, Children Explore for providing this great guest post. Selena and I took a little break this week from our postcards. We had a very fun Geography lesson playing with some new toys that Selena received from some friends of ours. Selena received all these small doll houses complete with furniture, little people and all the accessories to make her own little town. There is a hotel, beauty salon, candy store, pet shop, cafe, cottages, and a dance studio. There are 8 little houses all together. This comes with a mat that lays on the floor with streets so we had fun making our own little town. We discussed maps, and how this could be any town or city she wanted it to be. She decided it was just Selena's City.  With the ice cream truck that came with it and other little cars that she has, she had fun driving from business to business. She can change the look and feel of her city in any fashion she wants to. A great hands on introduction to Geography. After our play time with this, she spent quite a long time playing with it by herself. Then she discovered the box it came in. Her box has been everything from a hiding place, batting box for baseball, car, and just a dream place to lay and watch the imaginary clouds on our ceiling. There she is! Thanks again Children Grow, Children Explore for sharing your learning game with us and thanks Amanda for sharing a photo with us. What a great idea! She can have a grand time making up stories about her town while playing.